This is an excellent book that comprehensively treats in one volume a wide range of issues associated with nuclear weapons. The topics Rotter examines include the history of nuclear physics; the relationship between the atomic bomb and two other antecedents (poisonous gas and strategic bombings); the Manhattan Project, Japanese and German nuclear projects during World War II; the U.S. decision to drop the atomic bombs on Hiroshima and Nagasaki; nuclear weapons and the Cold War, which includes the Soviet, British, French, Israel, South African nuclear projects; nuclear proliferation in India and Pakistan; and contemporary issues. This book is not based on any archival work and hence one cannot expect any new revelations in any of the topics Rotter examines. But he has read secondary sources widely and critically. The result is a provocative book that raises penetrating moral issues on the development of nuclear weapons. Two themes run through the entire book. 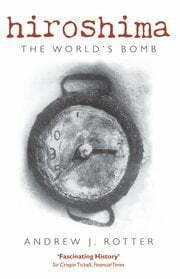 First, Rotter argues that the atomic bomb is, as the title of the book shows, the world’s bomb from its inception to the contemporary nuclear question. Discussing the world-wide context of the development of nuclear weapons, the author points out a basic contradiction and tension between the “republic of science,” which postulates open exchanges among scientists beyond national borders, and national secrecy that developed in bomb making during World War II and the Cold War. The discovery of nuclear fission is a story of stimulated exchange among the world’s luminaries of nuclear physicists, and the U.S. Manhattan Project itself was first stimulated by the British Maud Committee, and had the participation of a whole host of émigré scientists. In fact, the physicists who were separated into enemy camps during the war, Werner Heisenberg of Germany and Yoshio Nishina of Japan, and during the Cold War, Peter Kapitsa in the Soviet Union, Peng Huanwu in China, and Homi Bhabha in India, were connected with each other through the laboratories in Cambridge or Edinburgh. Employing Etel Solingen’s four-tiered typology using “pluralistic-authoritarian” and “market-oriented and centrally planned” as two axes, Rotter examines the irony that the invention of the atomic bomb was possible first in pluralistic-market-oriented America, while in Germany and Japan it failed, and in the Soviet Union it was delayed. An interesting part of the book involves the author’s treatment of Heisenberg. Rotterchallenges the myth that Heisenberg and others had conspired to subvert research toward a German atomic bomb. The second consistent thread that Rotter pursues throughout this book is the moral responsibility of the scientists and policymakers in developing weapons of mass destruction. In this respect, his discussion of poisonous gas and the strategic bombings as two antecedents of the use of atomic bombings is to be applauded. He argues that poisonous gas came to be considered unethical, not because gas killed more men more efficiently than other weapons, but because of the insidious way that gas killed — by burning, blinding, and suffocating from inside. It was thus similar to the radiation of the atomic bomb. Strategic bombings that targeted mass civilians served as a prelude to the atomic bombings. Rotter points out that like atomic bombs, gas and strategic bombings were justified on the grounds that the more terrifying weapons were, the more quickly the war would end. Three chapters dealing with the U.S. development and its use of the atomic bombs on Japan form the central focus of this book. Rotter raises the penetrating moral question of the responsibility of scientists in building and approving the use of the atomic bomb. He argues that a just war may not necessarily justify methods that violate justice in war. The scientists involved in the Manhattan Project and the policymakers responsible for the decision to drop the bomb were fully aware of the awesome destructiveness of the bomb. But they believed that using the bomb would defeat the enemy more quickly than not using the bomb and thus save human lives on all sides. Rotter questions the argument that any means can be employed if the cause is represented as just and the aim is to end combat as soon as possible. The author perceptively recognizes the self-deception that seeped into the thinking of policymakers including Stimson and Truman that somehow the atomic bomb would destroy military targets, sparing civilians, even though they were fully apprised the effect of the bomb. I do not think that Rotter takes this argument far enough. Pointing out the importance of the Potsdam Declaration which the Soviets were not asked to sign, he perceptively notes that this ultimatum offered Tokyo no meaningful modification of terms. But one wishes that Rotter would have gone further in examining the implication of the Potsdam Declaration, since, as Rotter notes, Japan’s “rejection” was the direct reason for Truman’s decision to use the bomb. Why did Truman decide to exclude Stalin’s signature, when Stimson’s draft proposal assumed that the Soviets would sign the ultimatum, and why did he reject Stimson’s insistence on promising the Japanese that they could retain “the monarchical system under the current dynasty”? In fact, why did Truman issue an ultimatum that he knew the Japanese would reject? Rotter brushes aside these crucial questions, and thus fails to see the cardinal significance of the Potsdam Declaration. Likewise, on the crucial issue of whether the atomic bombings or Soviet entry into the war played a more decisive role in Japan’s decision to surrender, he merely cites conflicting evidence and the lack of “a smoking gun”, and settles with a “common sense” conclusion that “the infliction of death on many thousands …by a mere two bombs…along with Soviet intervention” was decisive in ending the war. Rotter sidesteps the crucial questions of how the atomic bombing of Hiroshima and Nagasaki and Soviet entry into the war influenced Japan’s decision to surrender. His evasion has led him to fail to challenge the prevailing American myth that the use of the atomic bombs was necessary and justified. Despite these criticisms, Rotter has written a provocative book that should be widely read by both scholars and the public.